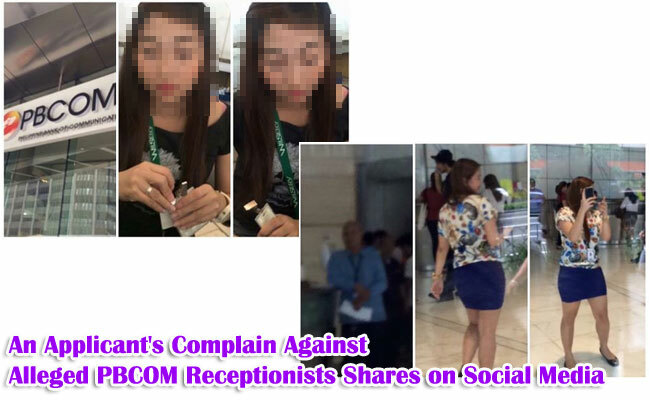 A Casino dealer applicant named Janica Marie Flores shared on social media her complaint against two receptionists and a security guard of PBCom Tower in Makati after she and her friends allegedly experienced rude treatment from them. Flores posted on her Facebook account the incident that happened last June 15, 2015 at around 3 o’clock in the afternoon on the said building with photos of the staff involved. Flores did this to call the attention of the PBCom management and in order to recognize the persons on the photos. According to her, she and her friends applied for a Casino dealer position in one of the companies with office located at PBCom Tower. During the application, the interviewer who happened to be the recruitment agent said that after applying with their company, they should also try other companies in the said building. The applicants did what the recruitment agent said and they transferred to the 12th floor of the building to apply. When they were falling in line in an elevator, they were waylaid by two receptionists (the girl in black and floral on the photo), who were tasked to give visitor’s I.D. to explain the building’s policy but the applicants found them rude. The receptionists insisted that they should have 1 transaction per day only. Flores continued that when they reached a certain floor of the building, they stayed there for a while in order to wait for their other friends when the security guard did not allow them to stay, instead they experienced another rude treatment. The same thing happened when they were about to exit the building. When Flores was about to get her ID, the security guard showed a photocopy of it threatening her that she’ll be banned from the building. The PBCom management of the building invited Flores for a talk and settlement and they explained that the receptionists are under a certain agency and they are not their employees. The girl in black is identified as Jemmae Tomas and the one in floral is Ailyn Dauden. For Flores’ complete story, read here. Some netizens voiced out that they also experienced the same thing. This is depicted through the comments.